The tomatoes are really coming in and I am trying to use them up every way I know how. Today I made this soup with both fresh tomatoes and fresh basil from our garden. You can also use canned tomatoes if you don't have fresh ones lying about. This soup got 2 thumbs up from Mr. Rosemary Lane!!! Bring tomatoes, onion and chicken broth to a boil and let simmer for 15 minutes. Let cool slightly some before adding it to a blender or food processor. 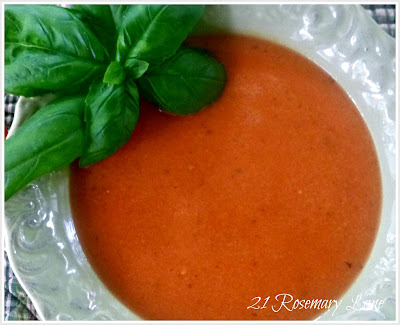 Add the fresh basil to the tomato mixture and liquefy the mixture in batches until the pot is empty. Then add the butter to the empty pot and let melt over low heat. Add the flour to make a roux, then add milk and while stirring continuously, cook over low heat until the mixture thickens and boils. Once milk mixture is thickened, add the tomato mixture to the pot. blend and heat through. Add the pepper to taste. One of my favorites. Looks delicious! Oh, my husband would so love this! He's the only one that eats tomato soup. I'm going to put this in my files!! He'll be pleasantly surprised when I make it! Thanks for sharing! Thanks for the recipe. I will be making this! Yum! Oh boy... they just keep on getting better and better! Yumm, sounds delish! Love how its not too many ingredients to, easy enough for me to give it a try :) Thanks for sharing! I would luv something yummy like this with a hot, toasty grilled cheese sandwich! Tomato soup is one of my faves. I've never tried making it from scratch but it is sure to be healthier. 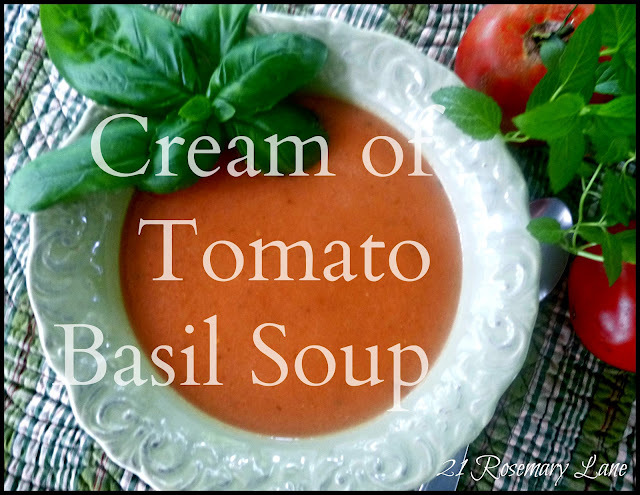 Thanks for sharing your recipe and its options on BeColorful this week.